I really DO love this flat. S bought this flat ten years ago, before we ever met, before we ever dreamed about getting married or having a kid. It was an awesome bachelor pad. It was great when we were dating. It was lovely when we were newlyweds. It was only when we started preparing for Junior that certain ...inconveniences... became more apparent. S lost the sole use of his office when we put in Junior's cot and changing table. We both cleared out bookshelves, stuffing Things We Don't Use All the Time in the loft (and in the crawl space, and in the closets, and in the airing cupboard, and underneath the stairs...) We rearranged the living room several times to make it more Junior-proof. And on the whole, it's perfectly fine. Let me show you a typical trip home from the grocery store. 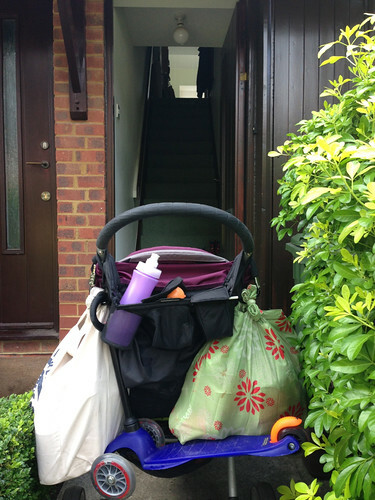 We don't have a car, so I use Junior's buggy to carry home heavy bags. We have a small kitchen and a v.e.r.y. small under-the-counter fridge/freezer, so I can't bring much home anyway. I don't bother with online grocery shopping because it's not worth it - we simply can't store enough food to justify the extravagance. It means I go to the local Sainsburys/M&S almost everyday, but on the other hand: most of our meat and veg is fresh, we don't tend to buy what we can't use, and it's only about a ten-minute walk from here. It virtually guarantees I have to leave the house everyday, and I get a bit of fresh air and exercise. 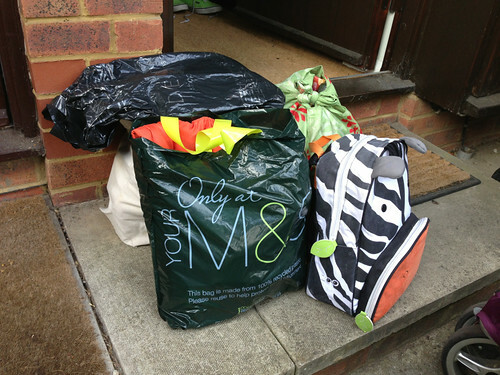 The hardest part, and this is the part that I won't miss at all, is getting everything back inside the flat. So, that took three trips up and down the stairs to carry the bags, post, and extra layers. Notice that we have self-enforced a rule not to wear our shoes inside the flat. Is it any wonder I wear sandals in summer and slip-ons in winter? Then there was a fourth trip upstairs to bring Junior inside and place him gently in his cot. Then I had to retrieve the buggy. 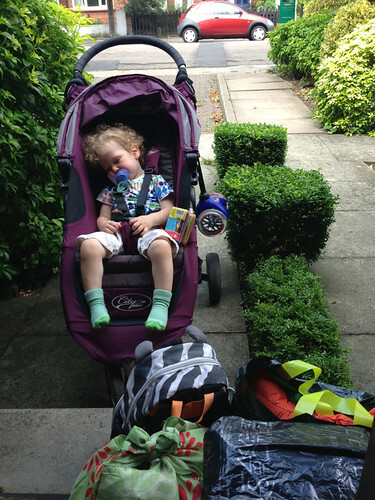 We chose a folding buggy because - well, we didn't really have an alternative. Before Junior was born, my dad rigged up a clever mountain bike hook with a luggage strap which serves to hold the buggy at the bottom of the stairs, and it has been a lifesaver. Still, it requires folding every time we come home, and unfolding every time we go out. 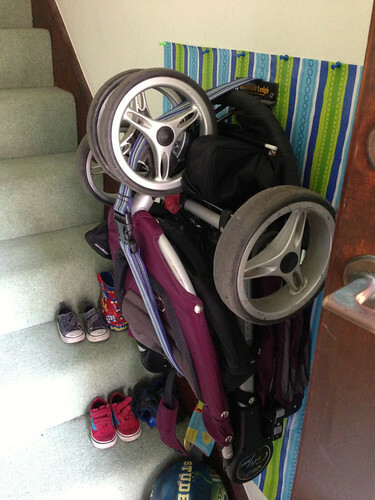 I'm looking forward to the new house where we can just wheel the buggy - and Junior and all the bags - inside and leave it open under the stairs unless we choose to fold it. Choice! Freedom!